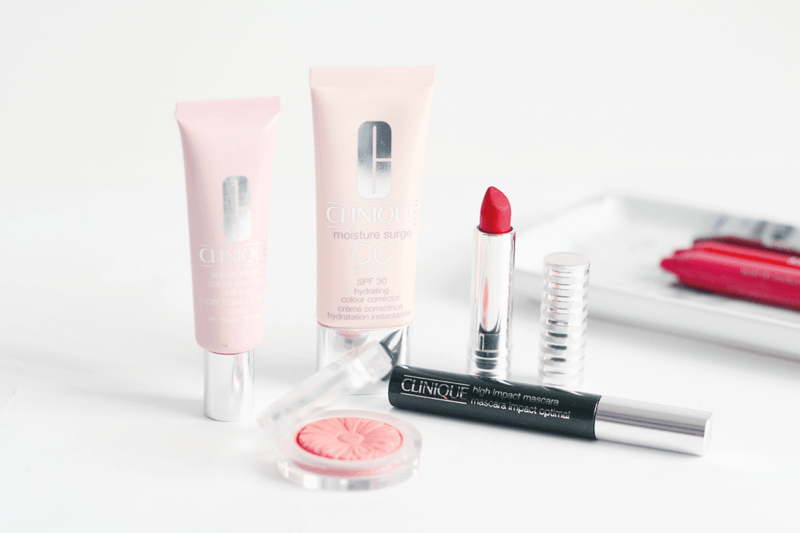 Starting with their base range, I’m a huge fan of the Clinique Superprimer Colour Corrects Dullness. It really helps brighten my dull complexion and is perfect when it needs a bit of a boost! I like how the range is tailored so different skin issues, so you know there’s one for you. I’d definitely recommend it, as it works to blur pores as well as colour correct, so it’s a great all-rounder. I’m also a fan of the Clinique Moisture Surge CC Cream, as it’s a great base. Firstly, it’s SPF 30 which makes it a great Spring/Summer option, plus it works amazingly to cover blemishes and even out tone. I find this can give up to medium coverage, which is great for a CC cream and stays all day, while giving your skin a hydrated feel! Definitely one to look at if you’re after a new base. I know they’ve recently brought out some new shades of their cheek pops, but I still really love the Clinique Cheek Pop Blush in Peach Pop, as it’s such a brightening and flattering shade. It looks quite bright in the packaging, but looks so natural when blended out on the skin! I must pick up more of them soon. The Clinique High Impact Mascara is one of the only mascara’s I’ve ever repurchased! It really adds volume to my lashes and lengthens them without them looking silly (as they’re already quite long). I also love how black it is and it seems to coat the lashes so well! I’ll probably always repurchase it. Lips are something Clinique does very well and I do love a few of their offerings. 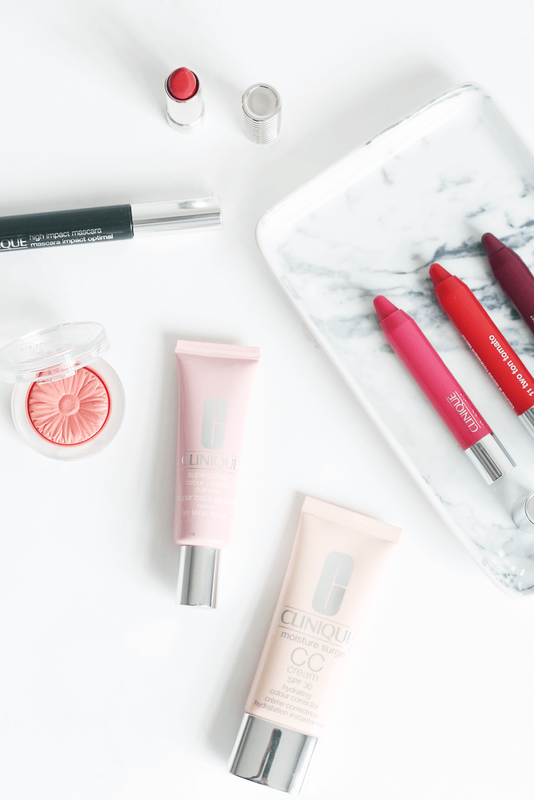 Their chubby sticks are definitely the most well known and the ones above are the Clinique Chubby Stick in Two Ton Tomato and Plumped Up Pink, which are super moisturising yet give a dash of colour. Perfect for lazy days! 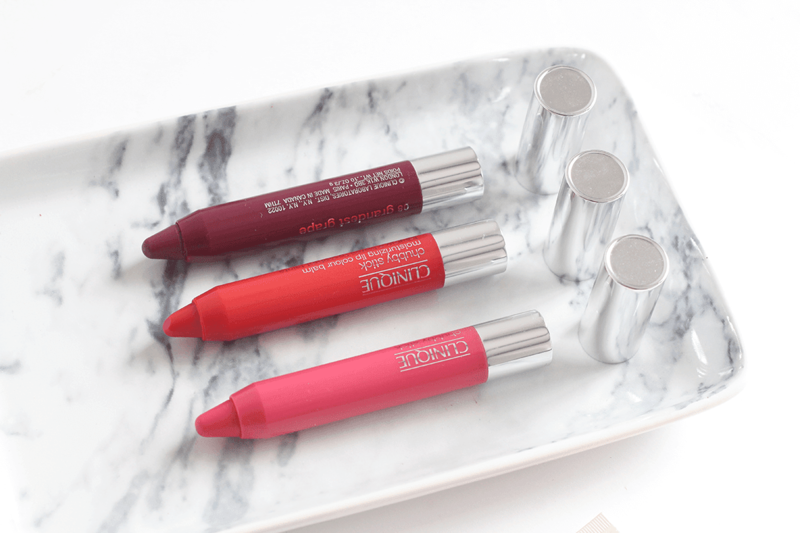 The Clinique Chubby Stick Intense in Grandest Grape has the same great lip balm properties, but gives off more colour if you’re more used to a bold lip! The Clinique Long Last Soft Matte Lipstick in Matte Crimson is one I reach for a lot, as it’s the perfect blue toned and flattering red that would suit so many. The formula is amazing too, as it’s matte but non-drying and stays put for so long!